Patachitra (pron. 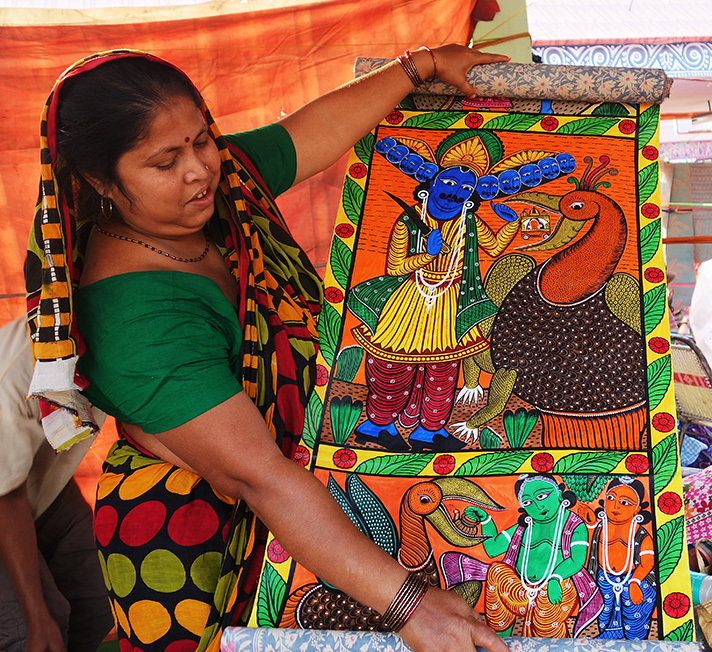 Pawtochitro) known for its brilliant play of colours, is a traditional folk art form of rural Bengal that has been in existence for many centuries. Patachitras are painted narrative scrolls executed by a class of itinerant singing scroll painters variously known as Patuas, Chitrakars, Patikars or Patidars and characterised by religious and social motifs and images painted on cloth. The word Pata (Pot) is derived from the Sanskrit word patta meaning a kind of fabric or silk cloth. There are two schools of thought regarding the origin of the Patuas. One links them to a tribal background while the other points to their presence in the Mauryan period as well as references in Sanskrit literature from the 2nd century CE. At any rate, from at least the 13th century or before (Frank J Korom, Village of Painters) , the Patuas of Bengal have walked from village to village singing moral and mythological stories, unfurling their painted scrolls to illustrate their songs, the lyrics and tunes of which they composed themselves. The Patuas were the chief source of entertainment in the villages and their art was a combination of storytelling, painting and singing. Since their stories carried an overtone of just and moral behavior, the Patua played the dual role of mobile entertainer and social reformer. Their art appealed to everyone and could be understood by even a child. For his efforts, the Patua would receive a little money but mostly payment in kind. 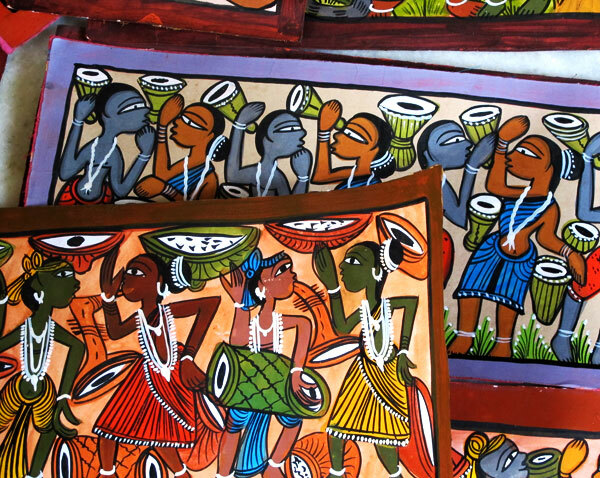 Patachitras are made in two formats: the vertically scrolled paintings, the horizontally scrolled ones, both referred to as Jodano or Gutano Pata and the smaller square or rectangular formats, known as Chouko Pata. 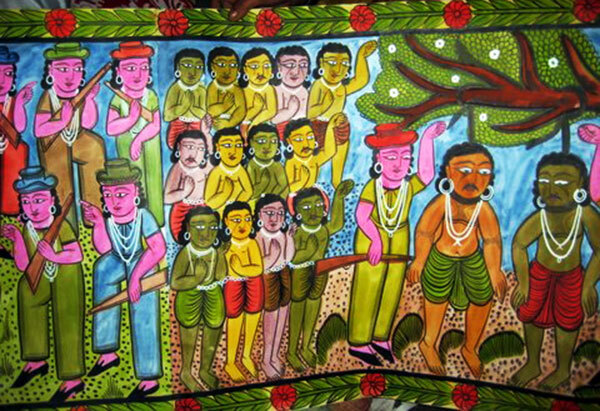 At any rate, from at least the 13th century or before (Frank J Korom, Village of Painters), the Patuas of Bengal have walked from village to village singing moral and mythological stories, unfurling their painted scrolls to illustrate their songs, the lyrics and tunes of which they composed themselves. The Patuas were the chief source of entertainment in the villages and their art was a combination of storytelling, painting and singing. Since their stories carried an overtone of just and moral behavior, the Patua played the dual role of mobile entertainer and social reformer. Their art appealed to everyone and could be understood by even a child. For his efforts, the Patua would receive a little money but mostly payment in kind. Before creating a Jodano Pata, the artist selected a subject and composed a song on it. The actual painting was often a communal affair with members of the family assisting the master artist. The story told in a Jodano Pata is always in painted panels or frames and the size of the Pata generally varies from one to three feet in width and six to twenty feet in length, depending on the length of a story. The two ends are attached to two bamboo sticks and the whole length would be rolled up tightly. 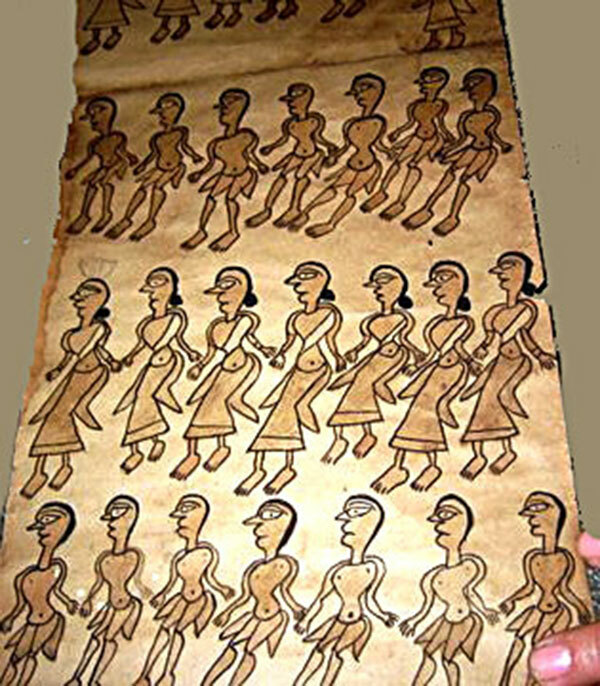 During the performance, the Patua would sing his story while slowly unrolling the scroll, one frame at a time, pointing to the various characters in each panel of the story. The story would emerge from a combination of the verbal images in the song, the pictorial motifs in the frames and the viewer’s imagination. Traditionally, the Jodano Pata was never up for sale - it was a continual hereditary profession. The Chouko Pata, however, could be sold. It is said that Patuas of the early days painted on palm leaves. Later processed canvas made from cloth, gum, eggshells was used and subsequently, handmade paper from cotton pulp. More recently, machine made paper, backed with cloth forms the canvas for the Patua. Pieces of paper are joined end to end to attain the desired length. Brushes are made from animal hair and the ingredients of the colours are always indigenous - for example,yellow from turmeric, blue from indigo, black from lamp black etc. The colours are blended with natural gum or boiled tamarind seeds to provide the glaze and coherence to the base.  Figures are painted in flat solid colours and then outlined in black. While some of these techniques are being revived today, many Patuas had taken recourse to buying paints and brushes from the market. The traditional themes of the Jodano Pata, which have passed from generation to generation, were based on popular episodes from Indian mythology like the Ramayan, Mahabharat, Puranas or the lives of female folk deities from the eulogistic Mangal Kavya narrative poems. There are also paintings depicting the lives of religious figures like Sri Chaitanya, Satya (Shotto) Pir and Gazi (Gaji) Pir as well as region specific patachitras based on local deities like the Bonobibi Pata. Alongside these were also the dramatic scrolled Jom Patas exhibiting ghastly sights of hell – the realm of Lord Yama or Jomraj, the God of Death – the intent of the grisly torture scenes in hell being to warn off sinners. A song would always accompany the presentation of a scrolled Pata. The Chouko Pata, on the other hand, was a single painted frame which dealt with a particular deity or a mythical or social subject or an animal and would not be accompanied by song – its purpose being more for a quick commercial return. During the British Raj, some Patachitra themes like Khudiram Pata and Sahib Pata were seen as “propagating protest” and were banned for some time. An urban incarnation of the Chouko Pata in nineteenth century Kolkata was the Kalighat Pata. The themes represented by Kalighat Patuas were not merely mythological but also came from their own contemporary social life, often with satirical ends which remains a significant source of the social history of that period. A very different style is to be found in the Patas associated with the tribals – especially the Santals, the largest tribal community in India, who live mainly in the eastern states of India. The Jadu Patuas are a community of Patuas who have been living among or in close proximity with the tribals. The patas they paint are associated with the rituals and rites, legends and myths, beliefs and prejudices linked with the life cycle of the Santals and the songs are sung in the Santali language. These Patas were said to have magical properties and over time, the Jadab Patkars came to be known as Jadu Patuas, the word Jadu meaning magic. 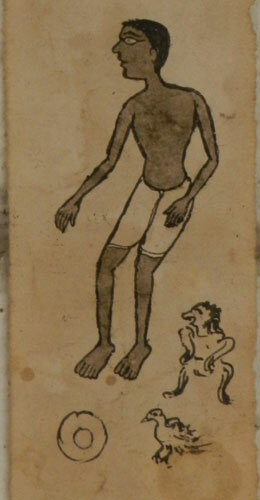 The tribals place a lot of faith on the Jadu Patuas - believing them to be the manipulators of life after death. Although all the patas created by the Jadu Patuas are known as Jadu Patas or Santal Patas, the term is usually synonymous with the small square Pata accompanying the ritual of Chokkhudaan (the gifting of eyes). When a member of the tribal community died, the Jadu Patua would arrive on the scene with a painting, supposedly of the deceased, complete except for eyes without irises. The Patua would then seek cash or kind from the kith and kin of the dead man on the plea that the dead person would not find his way to heaven unless the irises were painted on to the picture. It was only after a suitable recompense was received were the ‘eyes’ added on. The Chokkhudaan Pata naturally had a market on sentimental and superstitious ground. The Jadu Patas are vastly different from the work of the regular Patas. Minimalistic, there are fewer colours used and the lines do not have the fluidity of the other Patas. Though the Patua community embraced Islam some centuries ago, thinking it would uplift them socially, they continued to maintain a dual identity. In an attempt to uplift them from their low social status, there was an effort to bring them into the Hindu mainstream in the early part of the 20th century. But this had no real impact on their status and with many returning to their former religion or mixed status. However, they began to append the title Chitrakar with their names, and in the census report of 1951 the Patuas were finally recognized as Chitrakars. Most Patuas today bear both Hindu and Muslim names. Traditionally, Patuas were to be found mainly in various villages in Medinipur, 24 Parganas, Birbhum, Bankura, Howrah, Murshidabad and Bardhaman districts of West Bengal. Till the early 20th century, there were various regional differences, with Jodano Jom Patas being made in Birbhum district; Satypir, Vaishnav Pata etc made in Medinipur and in the 24 Parganas, the speciality was the Gajir (Gazi Pir) Patas. Other pats also in demand in rural Birbhum were the Nimai Sanyasi, Sindu Badh, Krishna Leela, Sitaharan, Durga wearing her conch bangles etc. Other than themes, there were stylistic differences too between regions. 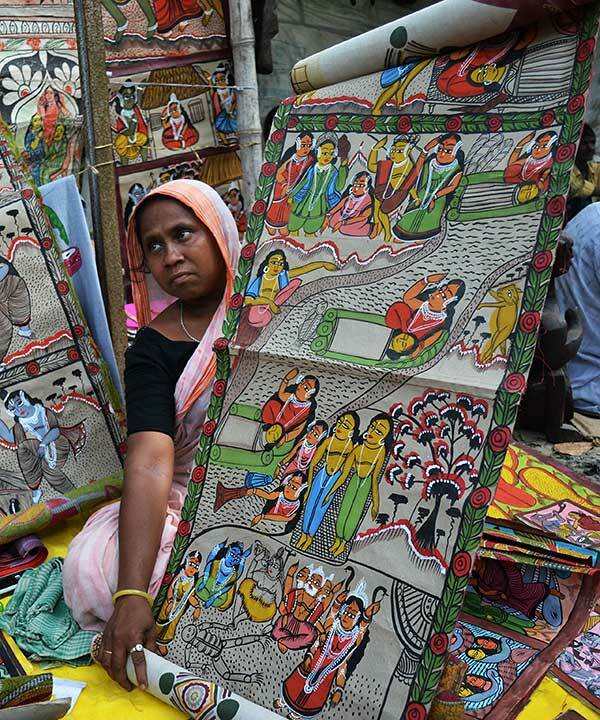 But gradually, barring Medinipur and Birbhum, dire economic circumstances together with modern forms of entertainment forced many artists in the remaining districts to give up their traditional craft. Banku Patua was a very famous patua from Birbhum who had been invited abroad several times. His sons struggled to uphold this tradition - but the recent death of Shantanu Patua in February 2017, has dealt a blow to this tradition. Murshidabad once boasted a rich patachitra tradition (the Kandi school). Some four decades ago, the Murshidabad patuas who belonged to the Bede community came to be recognized as scheduled tribes. With this change in their social status,and encouraged by government benefits for scheduled castes and tribes,they gave up their Patachitra art in favour of formal education. Many of them went on to mainstream occupations. In the last few years however, encouraged by the Medinipur boom, some families have begun to return to their roots. But the quality of their work reflects this break in tradition. Some Patuas treated painting as a subsidiary occupation being primarily icon makers, makers of dolls and idols of deities. In the few pockets that the tradition remained, the Patuas languished on account of social neglect and lack of appreciation. No longer the primary source of village information and entertainment,singing painters ceased to go from door to door displaying their paintings, as they did in the past. Many were even forced to turn to other occupations or even take up manual labour. 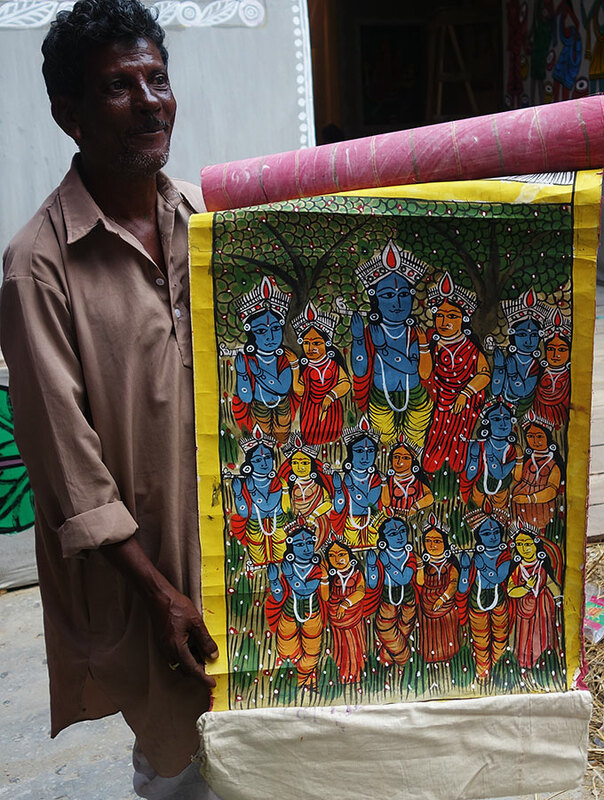 Abject poverty notwithstanding, a couple of villages in Medinipur - Naya in West Medinipur and Hobichak in East Medinipur, managed to hold on to their art. Sustenance came their way in the eighties when , the state government and NGOs, recognising folk art as an effective tool to reach out to the grassroots, started utilising them to educate the masses on subjects like family planning, immunizations, literacy campaigns, etc.Though this was a move away from tradition, it was welcomed by the Patuas as it meant regular income for many of them. With the increased exposure came an increasing demand. More and more Patuas, in the regions where the art still prevailed, learned to rhyme and paint. State patronage and new market opportunities paved the way for a resurrection of sorts. They began receiving international attention too. The outcome of this was that the Patua tradition gradually began to be identified not as an oral and visual performance and as a story-telling aid but with a particular kind of painting. 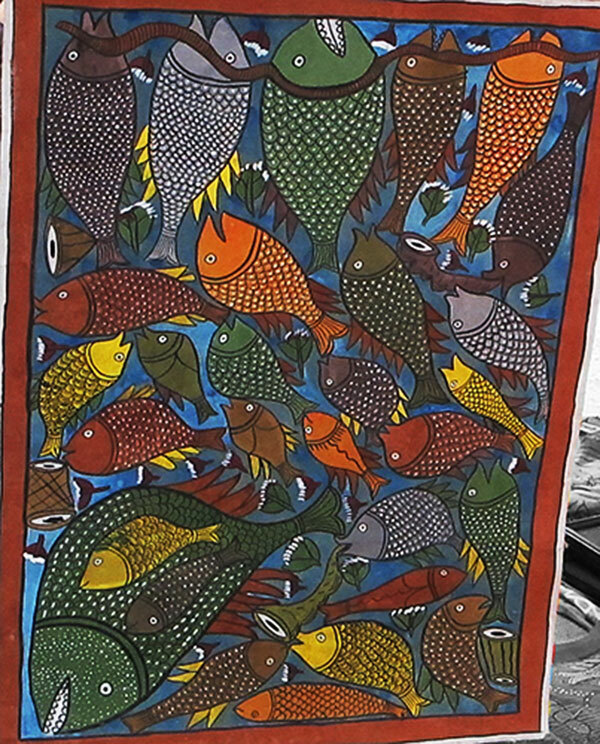 Thus while traditional themes were still being painted, very few Patuas earned their livelihood in the traditional manner – a phenomenon that exists to this day.Though the composition of narrative songs still accompanies or precedes the painting of the scrolls, the Patachitra has become a visual art. The song has become secondary and is often abridged; narratives that required an extensive story were neglected so that over time some of them disappeared. Often a song would be sung during the transaction of a sale as an added “bonus”. Its new identity as a commercially viable form led to innovations in the painting style of the Patachitras. With the chouko Pata being more popular than the jodano ones mainly because they occupied less wall space, the shape of the Pata began to change. For the same reason, jodano Patas which are now sold have become much smaller and whole stories have been cut down to fill up fewer frames.The themes more common among the Patuas of Medinipur are the Santal based stories and the Maacher Biye (The fish’s wedding). Today almost every Patua, at least in Pingla in West Medinipur, paints more Santal Patas than the traditional Puranic stories, having borrowed from tribal Jadu Pata style and colours. These we were told are far more popular among buyers. In fact, recognising that the original tribal Jadu Patas have become collectors’ items in cities like Delhi and Calcutta, many Patuas from Medinipur now also buy jadu Patas from adivasi areas and sell them in the big cities. These Patuas have, since the past decade or so, also started copying the Kalighat Pata style which is re-emerging as a marketable visual art form. In keeping with the times, Patuas continue to expand their range of topics. Modern themes include various regional events, urban, social and secular issues and even natural calamities (like the Tsunami). Patachitras have also been created around significant events such as the 9/11 (Laden Pata) and the destruction of the Babri Masjid. Prior to the 1980s, Patuas were mainly men. But since then after training was offered to them, women too began to paint and sell. Interestingly many of the woman Patuas of the villages, as indeed other female folk artists, also double as the local midwife – using this traditional training as a supplement to their incomes. The women in Patua communities also make handmade clay dolls called Jo Putul. Times have changed for the Patuas of Medinipur and especially for most at Naya. The more fortunate ones have seen a significant rise in their earnings, while others mainly depend on the sale of their works to art lovers and research scholars and eagerly wait to be invited to workshops or trade fairs to popularize their craft and to earn a living.